The quick trip to Bandon Dunes for LINKS Magazine couldn’t have gone much better. The weather was clear, cool, and windy, and although I only had two days at the resort before heading inland, I was able to pack in tons of golf. My round at Bandon Trails fell after a morning round on the Bandon Dunes course. 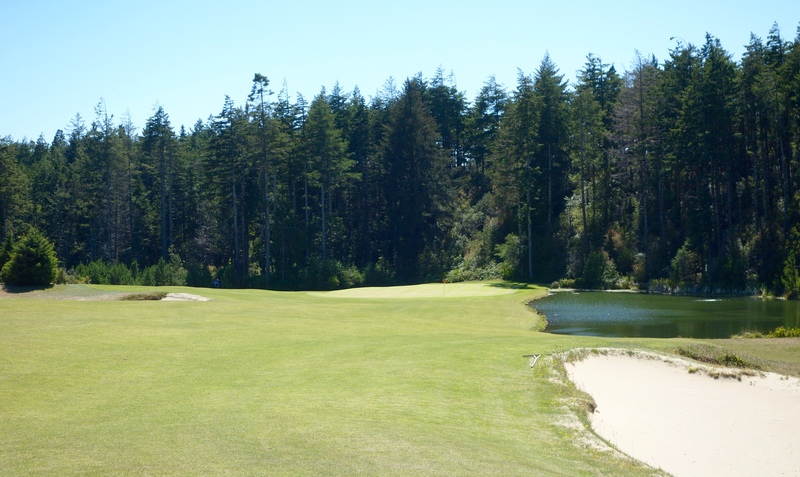 We finished that morning round early, had a leisurely lunch, and I then made my way up to Bandon Trails for a solo 18 holes. It was just me and my caddie, and we had the course to ourselves… does it get any better?! 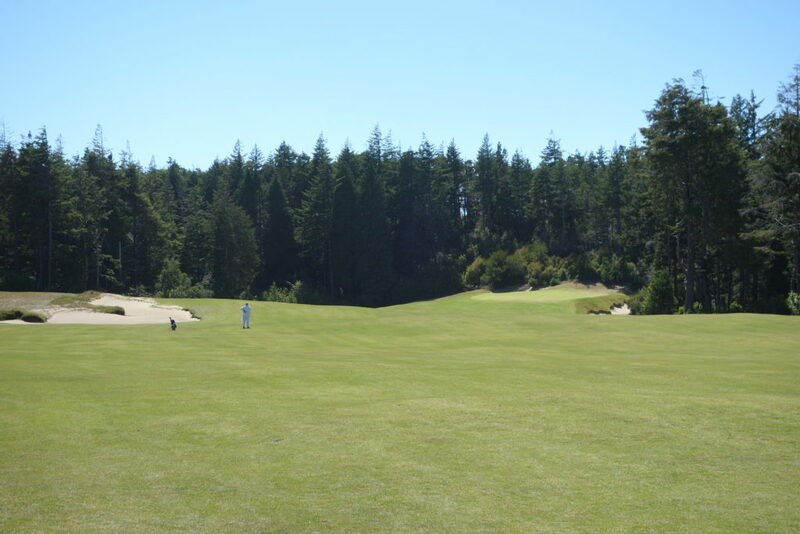 In some ways, I think of Bandon Trails like the St Andrews New or Jubilee courses. If those courses weren’t located beside some of the greatest links in the world, they would receive the individual attention and praise that they deserve. 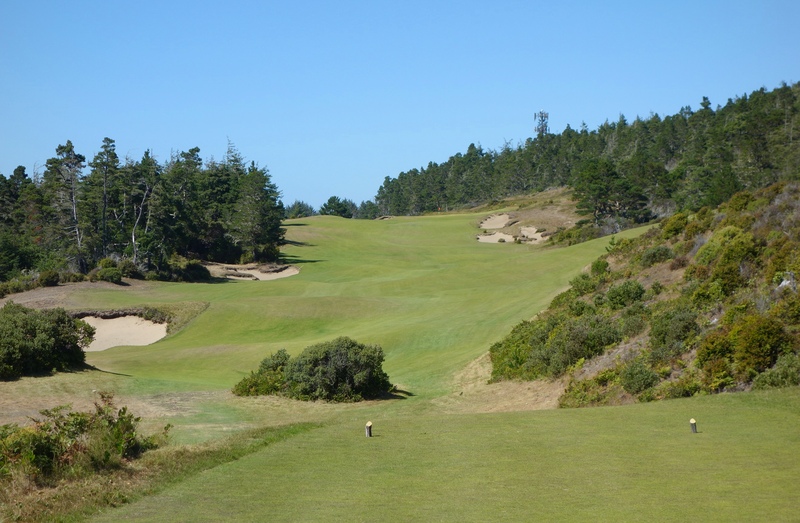 Bandon Trails suffers from the same problem with its three older brothers down on the cliffs. After playing a morning round on one of the most dramatic golf coastlines in the world, 18 holes in the woods suddenly doesn’t seem as impressive, even with its great views. 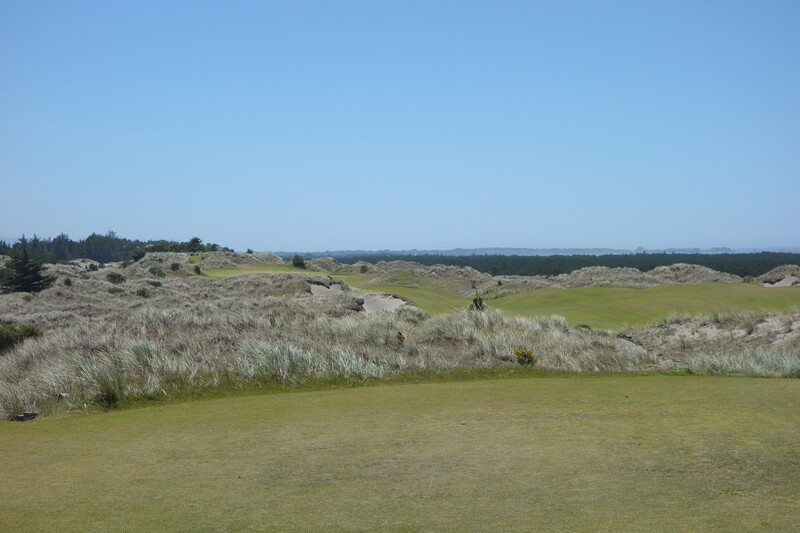 However, if you are able to separate the rounds from one another, Bandon Trails’ greatness is apparent. 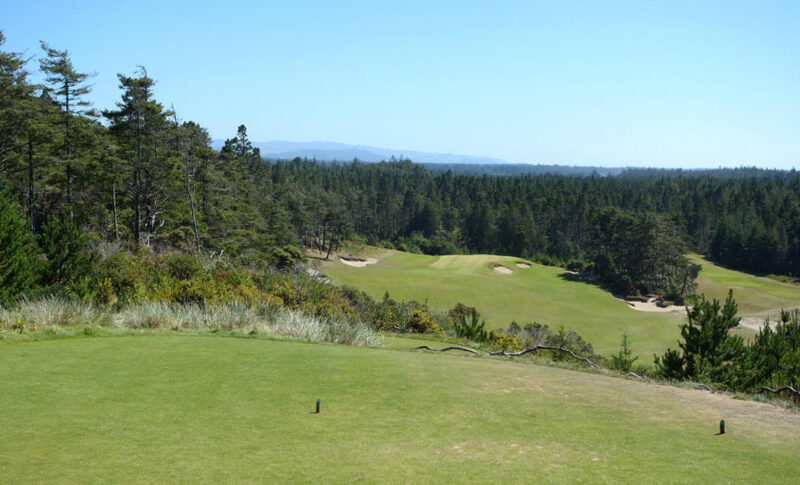 The course was designed by Bill Coore and Ben Crenshaw in 2005, and the piece of land they were given was a mixture trees, dunes, and rolling meadows sitting on a hill above the rest of the property. It was a challenging piece of land, but it also provided the opportunity to do something different. The design team managed to maintain many of the same links golf characteristics shared by its brothers, despite the terrain and less sandy soil. The course looks and feels different, but the running ground game is still required to score well. 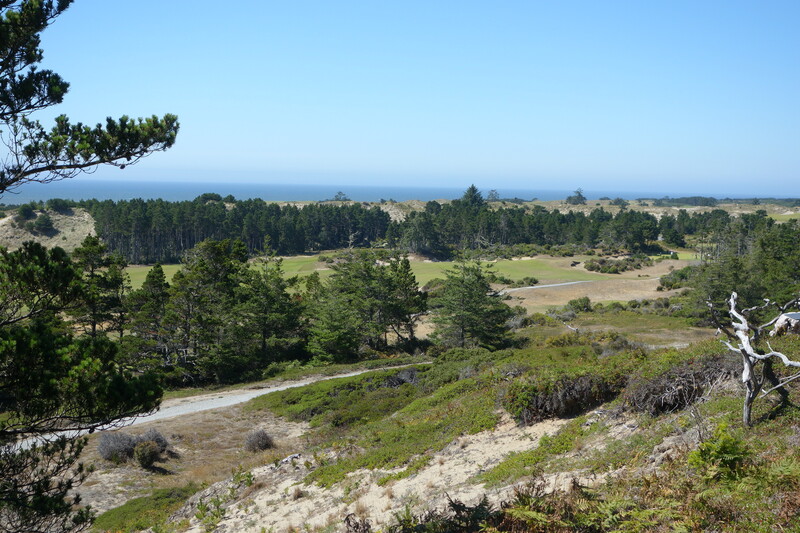 The highest point at Bandon Trails (seen above) also happens to be where Mike Keiser, Bandon Dunes owner, decided to purchase the property. The weekend prior to the round I had revisited Coore & Crenshaw’s Dormie Club outside of Pinehurst, North Carolina. 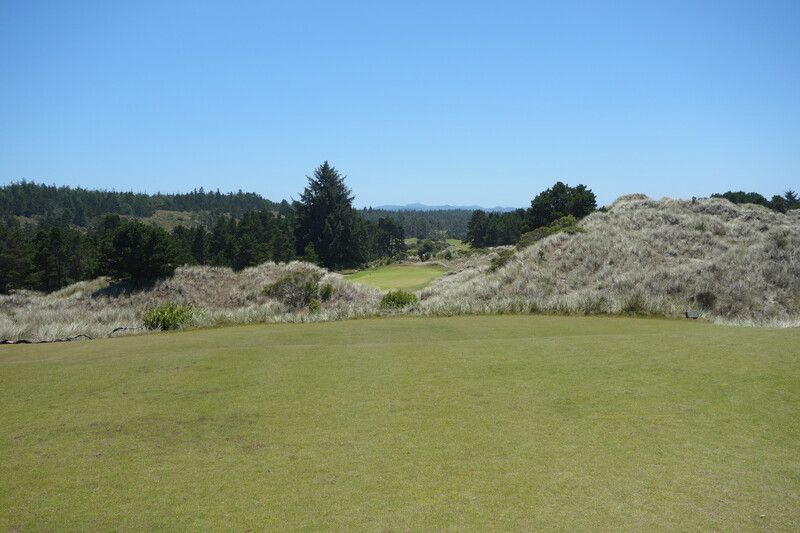 Bandon Trails and Dormie Club have a lot of similarities, but Bandon Trails easily wins out for me. 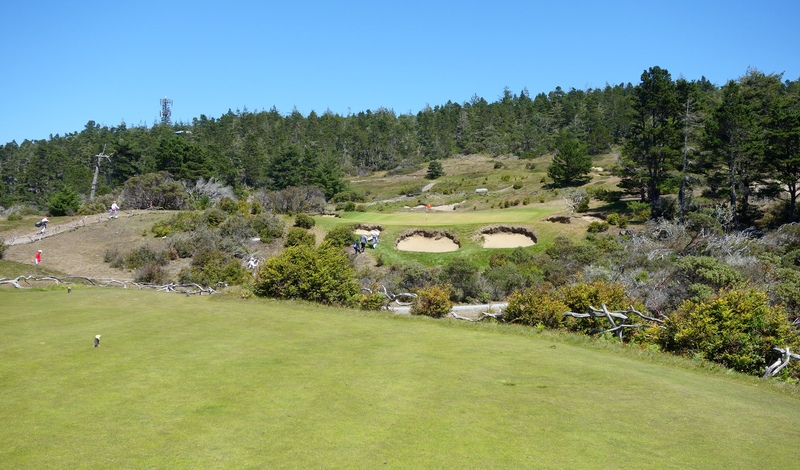 The elevation changes at Bandon Trails make for a much more dramatic round, and the course conditions at Dormie are much softer and less linksy. Both courses have big meandering fairways through corridors of trees. 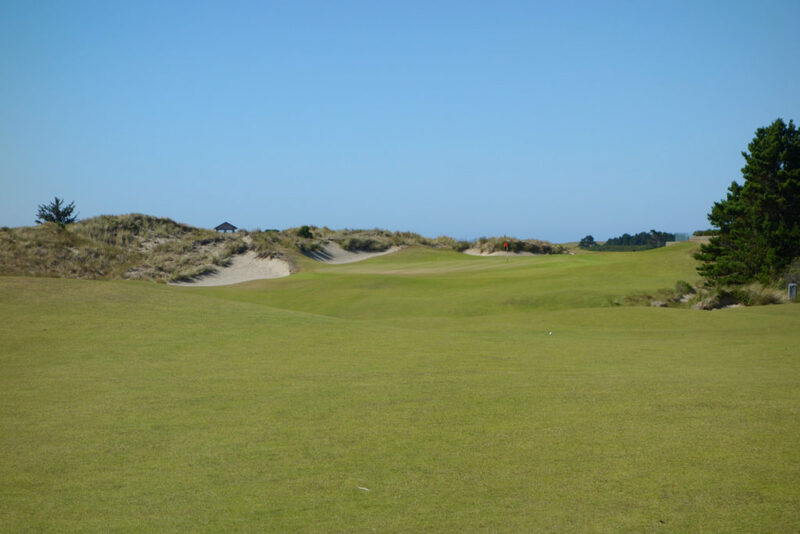 Hole #1 – 356 yards – The opening hole plays through dunes to a raised green. The area to the right of this first hole is the site of a proposed short course by Tom Doak. At the time of writing construction has been delayed, but look out for it in the future! 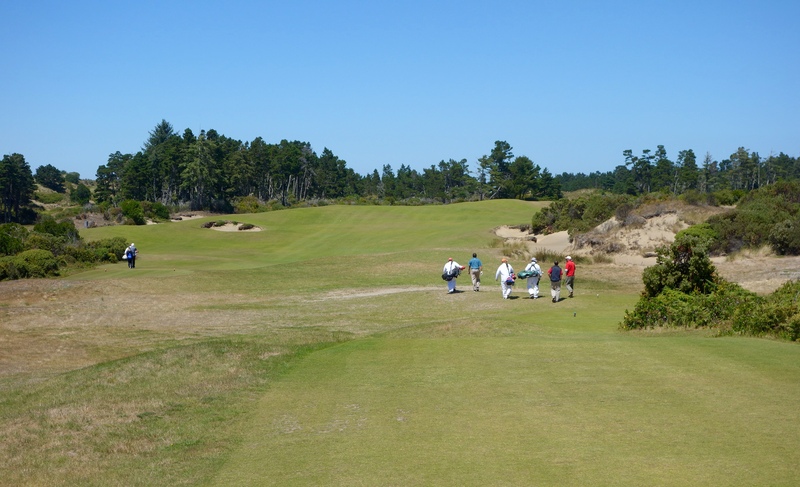 Hole #2 – 166 yards – This downhill par three marks a departure from the dunes, heading into the forest. The hole is much shorter than the number due to the elevation change. 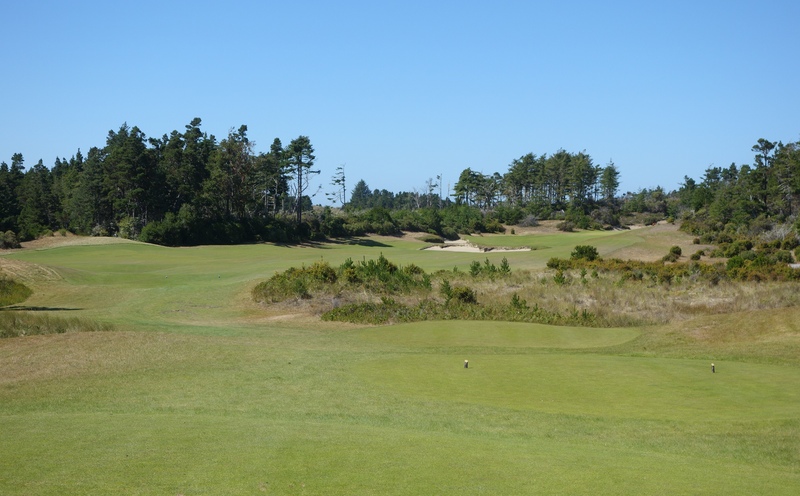 Hole #3 – 532 yards – You’re right on the border of the dunes and forest now, and this long par 5 features strategically placed bunkers at the tee shot and layup landing areas. 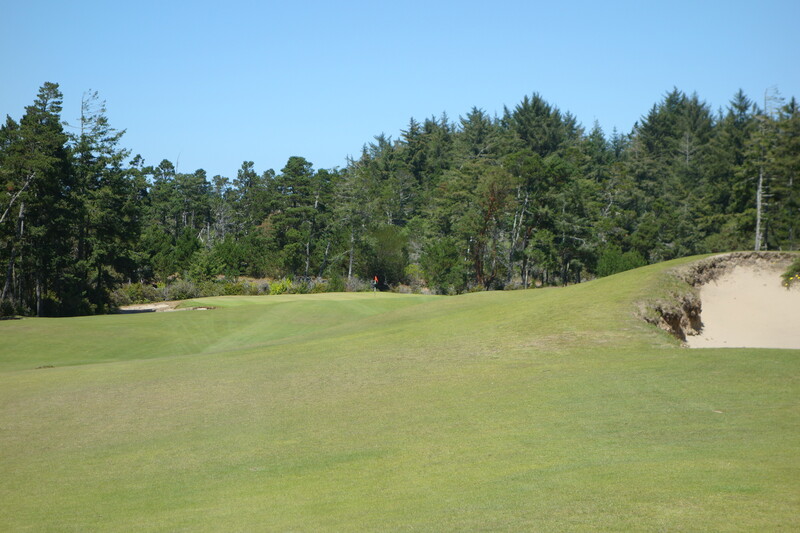 Hole #4 – 365 yards – Heading deeper into the woods now, this tee shot is blind up and over the hill. The green sits naturally in the landscape. 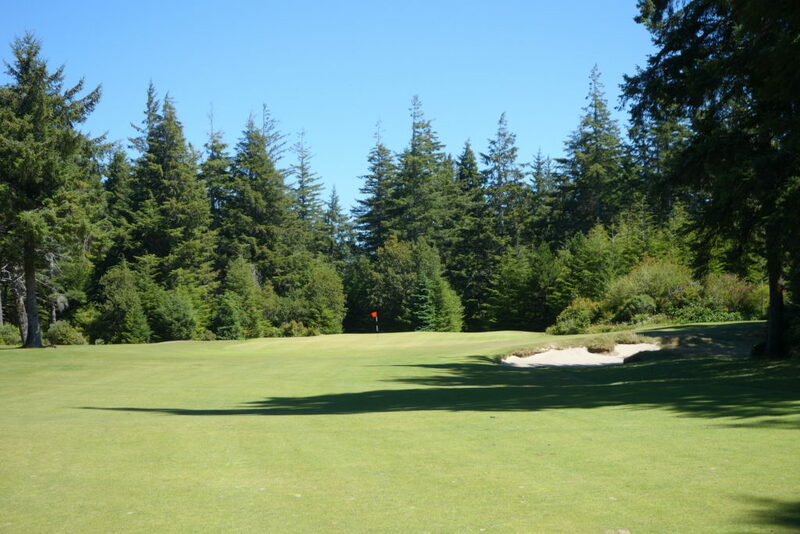 Hole #5 – 124 yards – This green is very large and the worst miss is short. This is the first of many strong par 3s on the course. Hole #6 – 359 yards – This hole features another blind tee shot up and over a hill. Bunkers pinch the tee shot and the green is sloping and quick. Hole #7 – 406 yards – This is a great uphill par 4 with another green that sits naturally in the landscape. The hole feels very wide, but the bunkers alongside the fairway are no joke. Hole #8 – 299 yards – While this hole is driveable for longer hitters, a long iron and wedge are a smart play for most. Hole #9 – 522 yards – A world-class par 5 here with a reachable cross bunker on the right. The hole narrows toward the green, which is relatively open considering the single bunker short right. Hole #10 – 393 yards – This hole narrows with bunkers toward a large green. Hit the fairway and the approach shot is straightforward. Hole #11 – 429 yards – Even though my caddie explained the huge fairway to the left, I still felt the need to take on the corner… not the smartest play! The green sits alongside a pond, which shouldn’t come into play, but is visually intimidating. 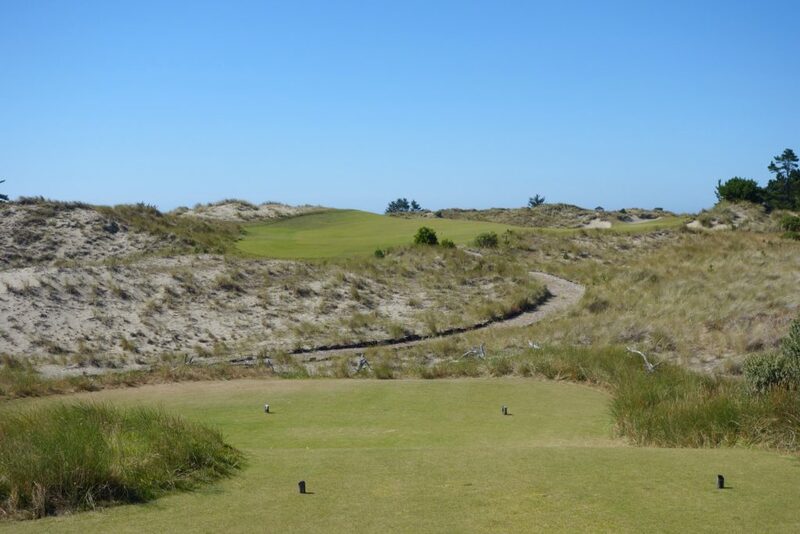 Hole #12 – 235 yards – This long par 3 is a perfect example of the links-style play on the course. I hit a low 4-iron here, which is my 210 club. The area short and right of the green is firm and kicks balls forward onto the putting surface. Shamefully, I missed the 12-foot birdie putt! Hole #13 – 374 yards – A downhill tee shot leads to a wide fairway, which narrows towards the tricky green. The pin in the photo below is also in a tough position on the right, where you’ll find a deep greenside bunker. 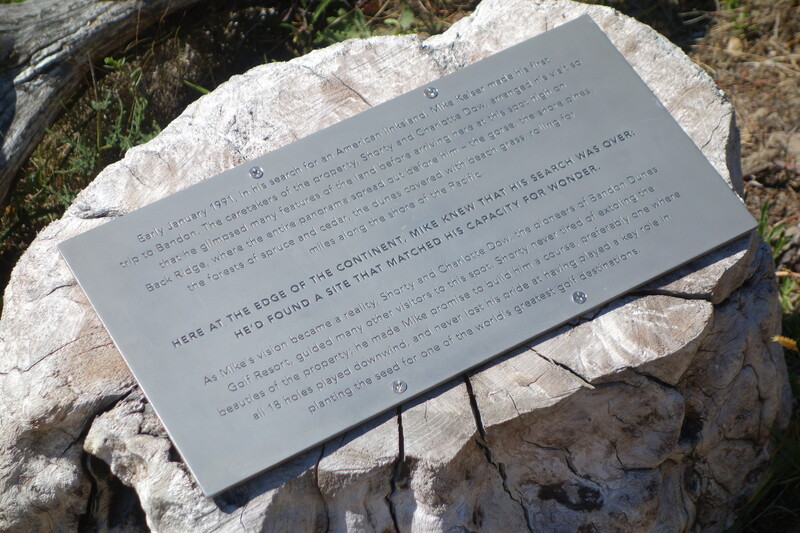 Hole #14 – 306 yards – This is the highest point on the course and it is where you’ll find the view and plaque mentioned in the introduction. To get to this tee, a shuttle brings you on a one-minute ride up a very steep slope. Walking it is an option, but that cart looks very nice after a couple of 36-hole days! The cart ride does point out a weakness in the routing where continuity was sacrificed for the great viewpoint. The sacrifice is worth it for the view. The 14th hole is straight downhill and while it is tempting to smash the driver, your ball can bounce any which way once it hits that hillside. Hole #15 – 367 yards – This is a very natural par 4 with another mean cross bunker. 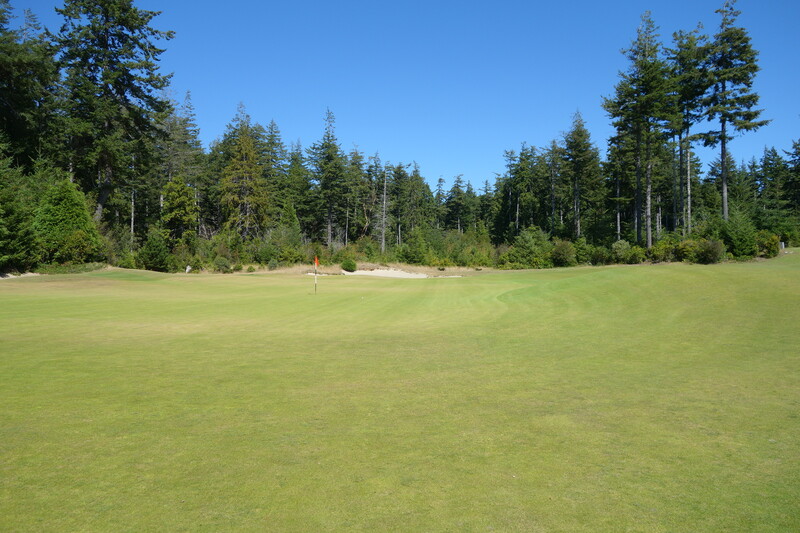 The green is bowl-shaped with scrubby bunker areas on either side. Hole #6 – 494 yards – I know that this hole splits opinions, and while it is beautiful, I think it would play better as a par 4 (thankfully for you, my opinion is worth what you paid for it…). The second shot on this par 5 is simply advancing the ball up the hill with very little strategy involved. Hole #17 – 159 yards – Yet another strong par 3! The sloping green allows for creative shotmaking. Hole #18 – 363 yards – This was one of my favorite holes on the course. You emerge from the woods and have a final hole in the dunes. The tee shot plays uphill to the fairway, leaving another slightly uphill shot into the large green. 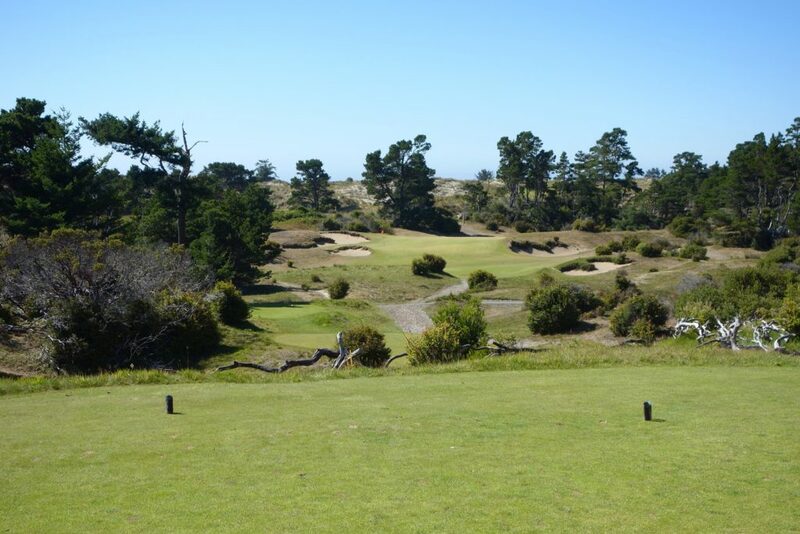 Coore & Crenshaw worked their magic on Bandon Trails, and the course features some beautiful natural holes. It isn’t until you pause and think about the heavily wooded site that you begin to appreciate the huge amount of work that went into building the course. 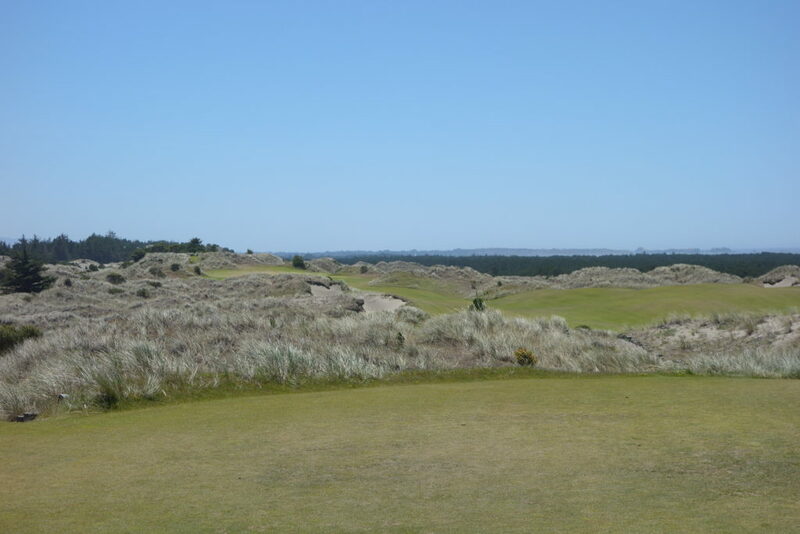 Bandon Trails will definitely be on the itinerary again next time I visit Bandon Dunes. 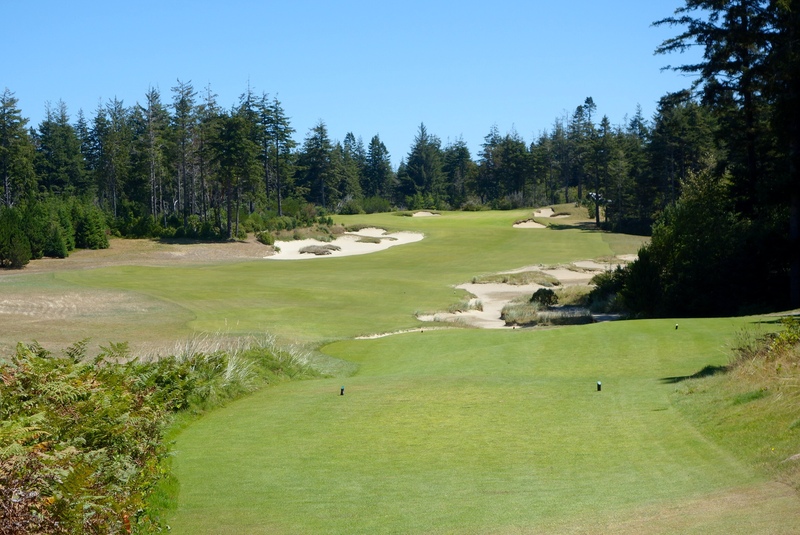 It may not have the visual power of Pacific Dunes and Bandon Dunes, but much of its enjoyment is found in how it differs from those courses. “The course was designed by Bill Coore and Ben Crenshaw in 2005, and it was their second design at the resort after Old MacDonald. ” Huh?? Old Mac was Tom Doak and Jim Urbina and was built after Trails. Thanks for taking the time to comment, Jed. I changed that sentence – error on my part! 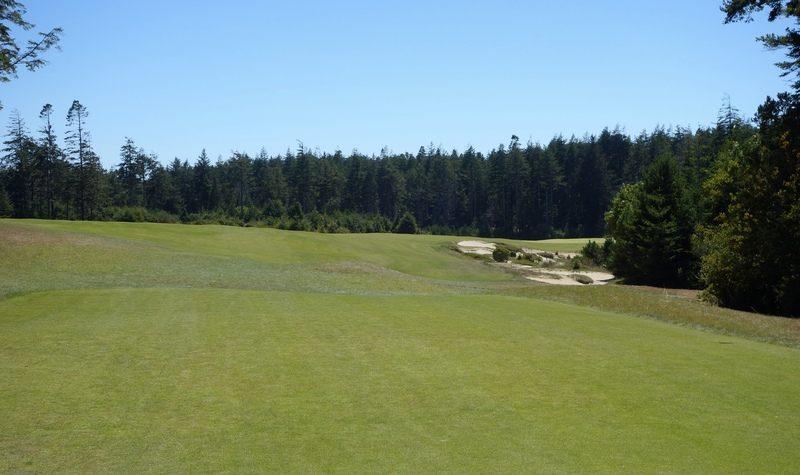 Coore and Crenshaw didn’t build old mac, and old mac was built five years after bandon trails. Agree on the rest though! Mistake on my end there! Thank you for quickly catching my mistake. I’m glad you agree about my take on the course – it was a very enjoyable round! 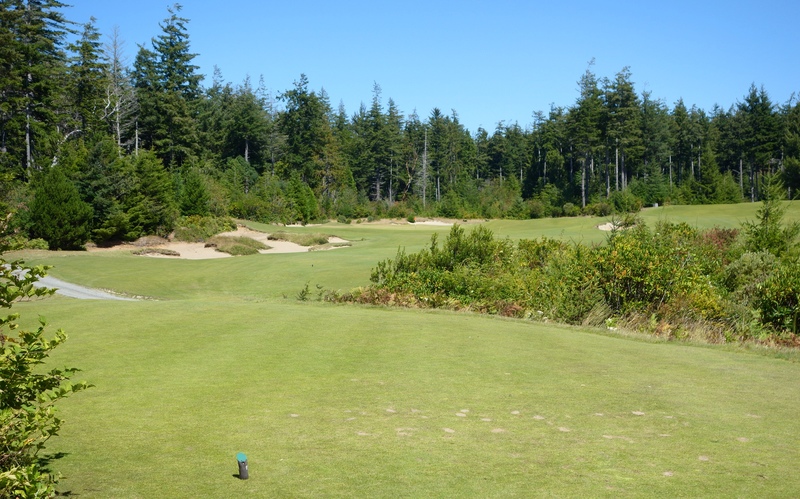 Agreed on Bandon Trails whole heartedly. I’ve made 5 trips to Bandon and it was only on my last trip did I play Trails. 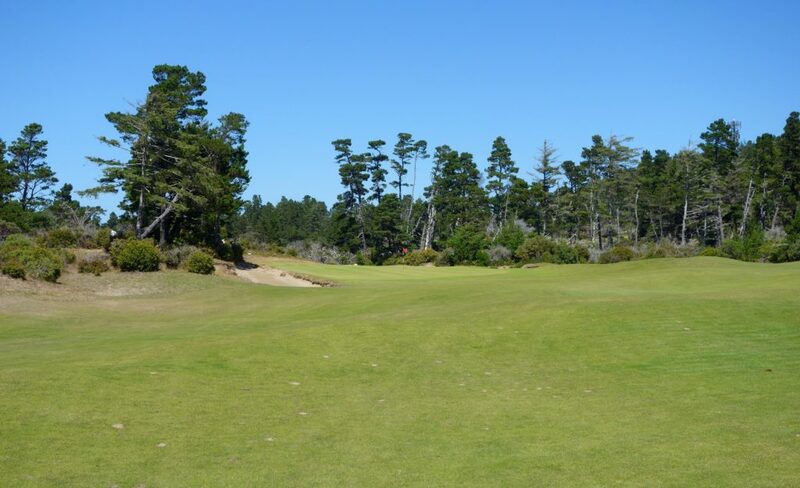 My buddy and I were the only ones on it last November and were blown away by its peaceful and almost zen feeling weaving among the huge ocean side forest.. Take that course and put it anywhere else and it’s a must play! And having just played the Old Course last week and shooting my all time low, well, that’s for the Old Course review on your site. Keep up the good work. PS…the restaurant/bar at Bandon Trails is my favorite. Sitting outside by the open fire pits over looking the ocean and par 3 course combined with the trees, it’s just tough to beat that. Chris, thank you for the comment and support! I was joking with my fiancee earlier that I had two emails, a few tweets, and two comments immediately after posting this… Dedicated readers! 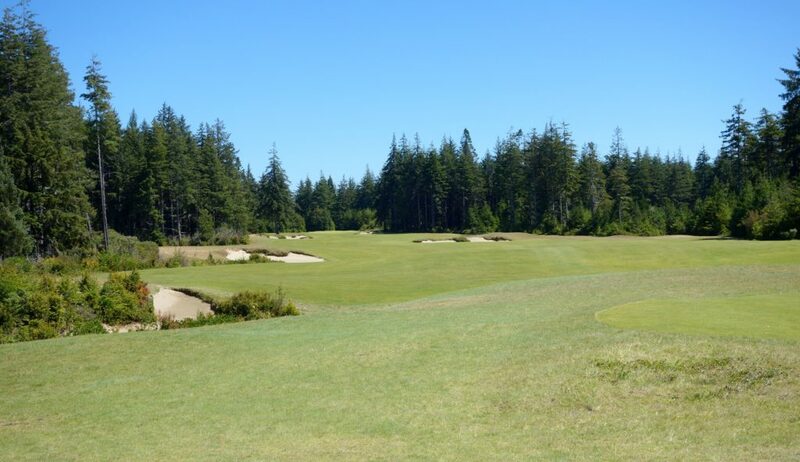 Peaceful is a great way to describe Bandon Trails. The one group that you see in the early photos was the only people I saw all afternoon. 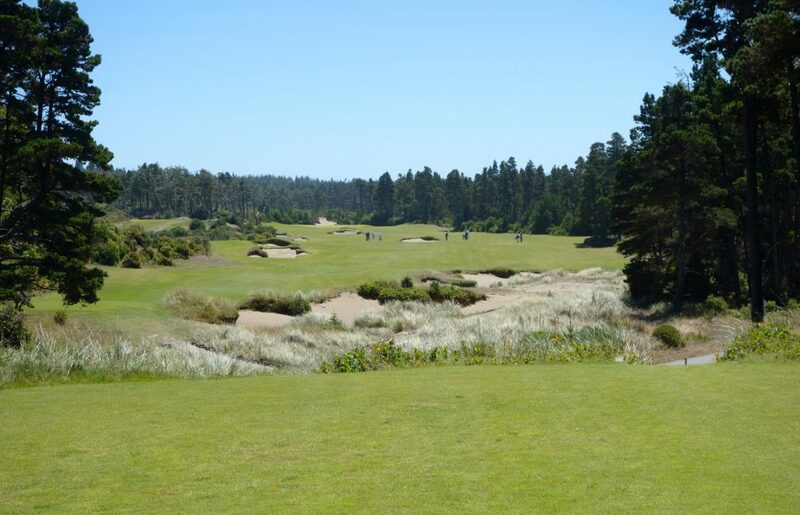 The semi-protected nature of the course was also appreciated after such a windy morning down on Bandon Dunes. Congrats on your low Old Course round – that is one you’ll never forget, I am sure. Thanks again for taking the time to write! I want to tell you that The Trials is usually the most underappreciated course at Bandon and truly a sublime golf experience,even when you have to grind up ‘ Heart attack hill’ to #14 (pre cart ride 2006). A really big walk for a 2nd 18,bring a caddie,but always worth it. Thanks for your review Graylyn! Enjoyed reading your review of the 3 courses. Didn’t get to play Old Mac? Anyways, I’m pretty sure your picture on number #8 of Bandon Trails is actually a photo of #6 of Bandon Trails as #8 doesn’t have a bunker in the middle of the fairway but does have bunkers visible behind the green. Hi Jeremy, Thank you for the comments! I didn’t have time to play Old Mac, unfortunately. 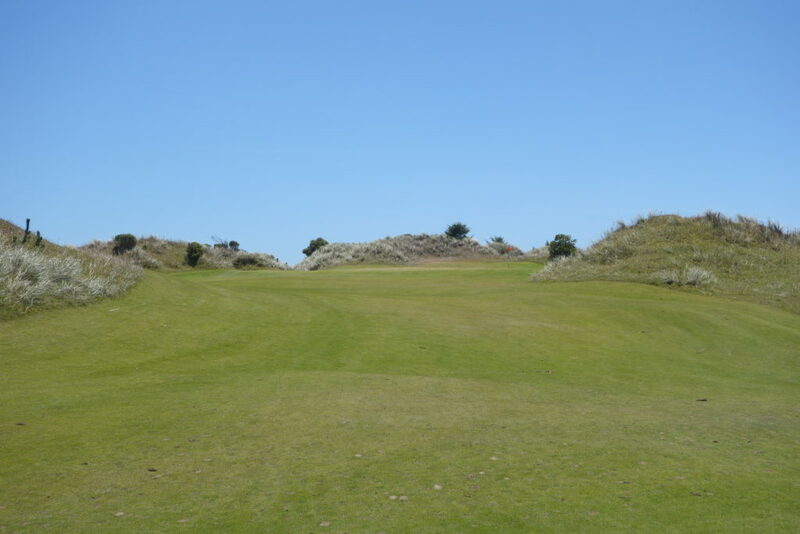 It will be the first that I play next time I visit Bandon. Also, great call on the wrong picture at #8. I hope to get back out there soon! I believe Old Mac has some of the most unique architect features on the property. More noticeably around the greens Tom Doak was able to try a few things that were risky as the course doesn’t really bare his name but he does deserve the credit. 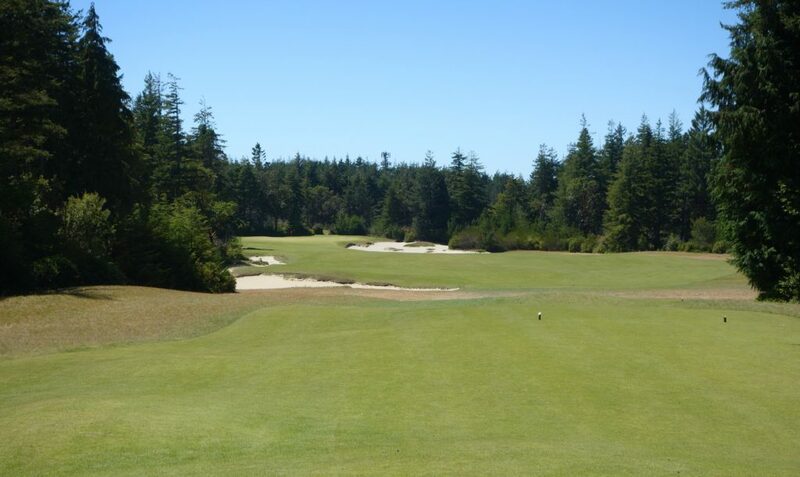 I liked your comment about Bandon Trails #16 being a better par-4. Its reminiscent to me of the par-5 16th at Pine Valley. The green on BT #15 and #17 are perfect so I thought this forced Coore & Crenshaw to make a trek across the land and make a longer hole in-between.